Yesterday I took my three youngest shopping for outfits for Seder night. When I entered the store, I was already feeling light-headed, in that hungry-thirsty-nursing-mother-on-a-hot-day kind of way. And then my baby got really thirsty from the heat, and started screaming. So I nursed him in the dressing room. And then the cashier tried to charge my credit card FOUR times over the course of twenty whole minutes, before it finally worked. During the eternity when the cashier was trying my card again and again, my 2-year-old, Yaakov, found exactly the outfit he wanted to buy for Seder night. Not the blue pants and white polo shirt I had chosen out for him. 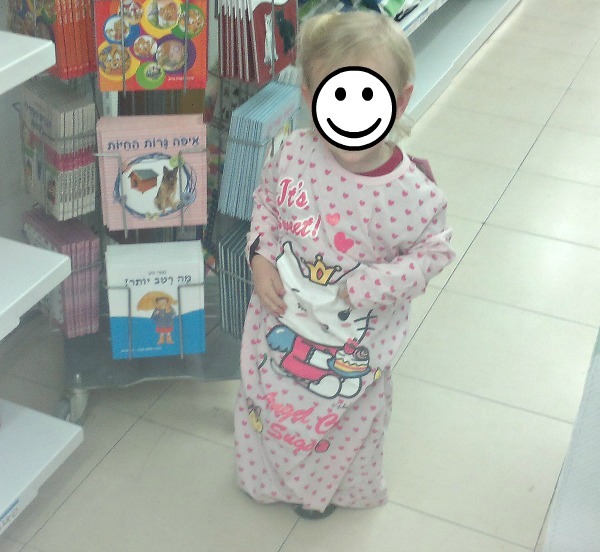 But rather, a pink Hello Kitty nightgown which was on sale for the low, low price of 20 shekels. Yaakov pulled the nightgown over his head (with the help of his giggling 4-year-old sister) and refused every single one of my repeated attempts to get him to part with it. When I finally had my receipt in hand, I was so exhausted, so hungry, so head-spinny that I wanted to cry. To scream. To yell at my 2-year-old who is equal parts adorable and stubborn rascal. But, instead, I took a deep breath and laughed instead. Mazal Tov to Author of "My 3 Kids and 6 Miscarriages"
yes he will laugh and so will you ! these are the greatest memories!! You did good, Chana Jenny! You did good. One day I asked my teenage son to open a large can of tomato sauce. I don’t know how it happened, but it slipped – and tomato sauce spun all over the kitchen. Seeing it splashed on the white ceiling, and all over the white counters, I looked at him and simply said, “Go take a shower.” I regret that to this day. I should have laughed . . and called out, “Someone get my camera!” You did good. At least it wan’t blood splattered everywhere! You describe that light headed feeling so well! I get that every time I go clothes shopping. I must be allergic to it. I give you mom of the year award for being able to laugh when you wanted to scream. A great lesson as we go into Pesach! !